In 2018, 1,018 single family homes sold in the areas both inside and outside of Bozeman’s city limits at a median sold price of $456,375. This is compared to 1000 homes sold in 2017 at a median sold price of $409,450, an 11.4% increase in median sold price. Restricting the data to homes sold just inside Bozeman city limits, 609 homes sold this year at a median sold price of $427,500, compared to 565 homes sold in 2017 at a median sold price of $381,500, a 12% increase. The price of buildable dirt in Bozeman has also been on the rise. 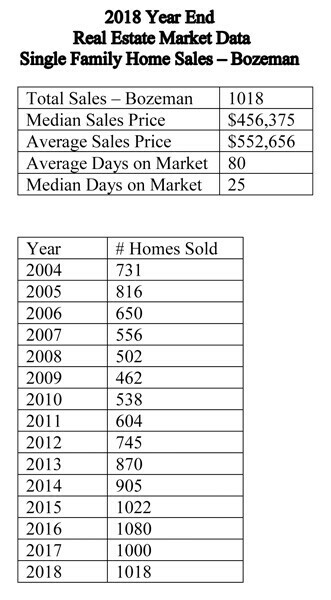 Subdivision lots in Bozeman have gone up dramatically in price over the past 24 months. In 2016, the median sold price for a lot in Bozeman was $76,000. That number rose to $84,900 in 2017, and then jumped to $124,900 in 2018. This equates to a 47% increase from last year and a 64% increase from 2016. The number of homes listed for sale was up slightly this year. 1,227 single family homes were listed for sale in the greater Bozeman area in 2018, versus 1,180 homes listed last year and 1,298 in 2016. The homes listed to homes sold ratio has remained relatively similar, with 83% sold this year, 85% last year, and 83% in 2016. The month’s supply of homes has also remained steady for the last 2 years at approximately 2.9 months for 2018 and 2017, compared to 3.2 months in 2016. This is the number of months it would take to sell the current homes on the market. Some often consider a “healthy” or “normal” market to have somewhere between 4 and 5 month’s supply. A higher number represents a buyer’s market while a lower number represents a seller’s market. Looking at the condo and townhouse market, the number of sales has remained fairly constant over the past 3 years while prices have been on the rise. 516 condos & townhouses sold this year at a median sold price of $296,250, compared to 509 units last year at a median sold price of $260,000, a 14% increase in pricing. Looking back to 2016, 511 units sold in the areas in and around Bozeman at a median sold price of $235,000. Interest rates continue to change. Most experts predicted they would continue to rise in 2019, but as of the date of writing, they’ve actually come down to a 9-month low, hovering around 4.5%. The included data reflects sales of homes in the greater Bozeman area, including Four Corners, Gallatin Gateway, Bridger Canyon, and Bozeman city limits. The data includes home sales reported through the local Big Sky Country MLS, and does not include private party sales.